Mahmoudi, R., Alinaghian, M., Mogouie, H. (2017). A mathematical model for sustainable probabilistic network design problem with construction scheduling considering social and environmental issues. Journal of Industrial and Systems Engineering, 10(special issue on scheduling), 17-37. Reza Mahmoudi; Mahdi Alinaghian; Hamed Mogouie. "A mathematical model for sustainable probabilistic network design problem with construction scheduling considering social and environmental issues". Journal of Industrial and Systems Engineering, 10, special issue on scheduling, 2017, 17-37. Mahmoudi, R., Alinaghian, M., Mogouie, H. (2017). 'A mathematical model for sustainable probabilistic network design problem with construction scheduling considering social and environmental issues', Journal of Industrial and Systems Engineering, 10(special issue on scheduling), pp. 17-37. Mahmoudi, R., Alinaghian, M., Mogouie, H. A mathematical model for sustainable probabilistic network design problem with construction scheduling considering social and environmental issues. Journal of Industrial and Systems Engineering, 2017; 10(special issue on scheduling): 17-37. Recent facility location allocation problems are engaged with social, environmental and many other aspects, besides cost objectives.Obtaining a sustainable solution for such problems requires development of new mathematical modeling and optimization algorithms. In this paper, an uncapacitated dynamic facility location-network design problem with random budget constraints is considered. Social issues such as public satisfaction as a function of construction time, number of missed jobs incurred in the regions under study and environmental considerations are incorporated in the model.Sincethe proposed model is expected to be capable of dealing with probabilistic network design, a new chance constraint formulation is proposed and manipulated to increase the applicability of the model in uncertain decisions. Moreover, the proposed method enables decision makers to determine the completion rate of projects through a time horizon while this notion is not achievable by applying other methods in the literature. The optimization of the proposed model is performed using anovel bi-section procedure in which a heuristic and a Simulated Annealing (SA) method are applied interactively. The efficiency of the proposed method is verified through a real world application of establishing a set of health care centers and the connecting links in MeshginShahr,Iran. The results of case study showed that all considered sustainable objectives come to a steady status in the fifth year. Also according to geographical data, the results about creating links are regional and the health centers have dispersed geographically in order to serve the demands of the whole under study region. Charnes, A. & Cooper, W.W. (1957). Management models and industrial applications of linear programming. Management science, 4(1), 38-91. Corominas, A., Mateo, M., Ribas, I. & Rubio, S. (2015). Methodological elements of supply chain design. International Journal of Production Research, 53(16), 5017-5030. Daskin, M., Hurter, A. & VanBuer, M. (1993). Toward an integrated model of facility location and transportation network design. The Transportation Center, Northwestern University, Evanston, IL, USA. Davari, S., Zarandi, M.F. & Turksen, I. (2013). The incomplete hub-covering location problem considering imprecise location of demands. Scientia Iranica, 20(3), 983-991.
de Assis Corrêa, F., Chaves, A.A. & Lorena, L.A.N. (2007). Hybrid heuristics for the probabilistic maximal covering location-allocation problem. Operational Research, 7(3), 323-343. Eskandarpour, M., Dejax, P., Miemczyk, J. & Péton, O. (2015). Sustainable supply chain network design: an optimization-oriented review. Omega, 54, 11-32. Eskelinen, P. & Miettinen, K. (2012). Trade-off analysis approach for interactive nonlinear multiobjective optimization. OR spectrum, 34(4), 803-816. Farahani, R. & Hekmatfar, M. (2009). Facility location: concepts, models, algorithms and case studies. 2009. Physica-Verlag, Heidelberg. Ghaderi, A. (2015). Heuristic algorithms for solving an integrated dynamic center facility location-network design model. Networks and Spatial Economics, 15(1), 43-69. Ghaderi, A. & Jabalameli, M.S. (2013). Modeling the budget-constrained dynamic uncapacitated facility location–network design problem and solving it via two efficient heuristics: A case study of health care. Mathematical and Computer Modelling, 57(3), 382-400. Hamta, N., Akbarpour Shirazi, M., Behdad, S. & Ehsanifar, M. (2017). A novel bi-level stochastic programming model for supply chain network design with assembly line balancing under demand uncertainty. Journal of Industrial and Systems Engineering, 10(2), 0-0. Jabbarzadeh, A., Pishvaee, M. & Papi, A. (2016). A multi-period fuzzy mathematical programming model for crude oil supply chain network design considering budget and equipment limitations. Journal of Industrial and Systems Engineering, 9, 88-107. Jena, S.D., Cordeau, J.-F. & Gendron, B. (2015). Dynamic facility location with generalized modular capacities. Transportation Science, 49(3), 484-499. Jena, S.D., Cordeau, J.-F. & Gendron, B. (2016). Solving a dynamic facility location problem with partial closing and reopening. Computers & Operations Research, 67, 143-154. Kannegiesser, M., Günther, H.-O. & Gylfason, Ó. (2014). Sustainable development of global supply chains—part 2: investigation of the European automotive industry. Flexible Services and Manufacturing Journal, 26(1-2), 48-68. Kirkpatrick, S., Gelatt, C.D. & Vecchi, M.P. (1983). Optimization by simulated annealing. science, 220(4598), 671-680. Klose, A. & Drexl, A. (2005). Facility location models for distribution system design. European Journal of Operational Research, 162(1), 4-29. Makui, A. & Ghavamifar, A. (2016). Benders Decomposition Algorithm for Competitive Supply Chain Network Design under Risk of Disruption and Uncertainty. Journal of Industrial and Systems Engineering, 9, 30-50. Marufuzzaman, M. & Ekşioğlu, S.D. (2016). Designing a reliable and dynamic multimodal transportation network for biofuel supply chains. Transportation Science, 51(2), 494-517. Melkote, S. (1996). Integrated models of facility location and network design. Northwestern University. Mestre, A.M., Oliveira, M.D. & Barbosa-Póvoa, A.P. (2015). Location–allocation approaches for hospital network planning under uncertainty. European Journal of Operational Research, 240(3), 791-806. Neto, J.Q.F., Bloemhof-Ruwaard, J.M., van Nunen, J.A. & van Heck, E. (2008). Designing and evaluating sustainable logistics networks. International Journal of Production Economics, 111(2), 195-208. Rabbani, M., Farrokhi-Asl, H. & Heidari, R. (2017). Genetic algorithm-based optimization approach for an uncapacitated single allocation P-hub center problem with more realistic cost structure. 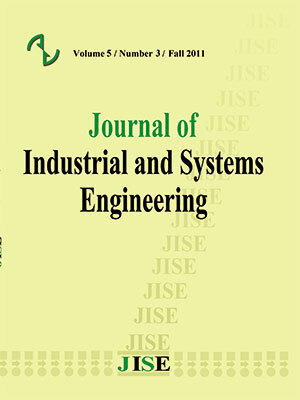 Journal of Industrial and Systems Engineering, 10, 108-124. Sheu, J.-B., Chou, Y.-H. & Hu, C.-C. (2005). An integrated logistics operational model for green-supply chain management. Transportation Research Part E: Logistics and Transportation Review, 41(4), 287-313. Skintzi, G., Ioannou, G., Prastacos, G.P. & Coats, T. (2003). Modelling of facilities for head injuries in London. Operational Research, 3(3), 197-212. Torres Soto, J. (2010). Dynamic and robust capacitated facility location in time varying demand environments. Vahidnia, M.H., Alesheikh, A.A. & Alimohammadi, A. (2009). Hospital site selection using fuzzy AHP and its derivatives. Journal of environmental management, 90(10), 3048-3056. Weber, A. & Friedrich, C.J. (1929). Alfred Weber's theory of the location of industries.